If you are not a Filipino then probably you do not know what are these. Ok We Pinoys love that cooked BAGOONG (Shrimp Paste) so much that we can eat it with just about anything. It may look gross and smell bad or pungent esp. for foreigners hehehe but gosh it is the best and tastes oh so good. I like it a bit sweet and spicy.. Yum Yum..
sarap! parang ang sarap kainin nito jen! i usually just pair the santol with salt ... lol. but am sure it will taste great with spicy bagoong, too! Interesting post. I wouldn't have guessed those. It's been ages na di ko nakakain yang santol since I left Pinas. Yummy bagoong jenn! wow sarap naman nito. i miss santol. we have a santol tree in the backyard sa davao, hehe! i love santol and have eaten them with various "sawsawan" from the plain salt to patis w/vinegar to soy sauce with vinegar! but i've never had it with bagoong. 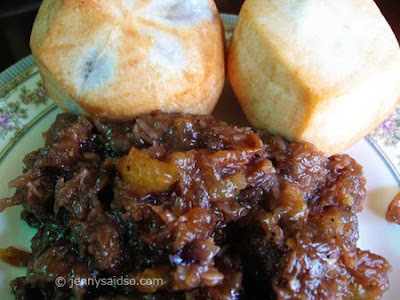 I miss santol very much!!! Yummy bagooong too.. Pag uwi ko eto kakainin ko talaga!